Gallipolis City Commissioner traditionally meets the first Tuesday of the month at 333 Third Avenue in the Gallipolis Municipal Building. 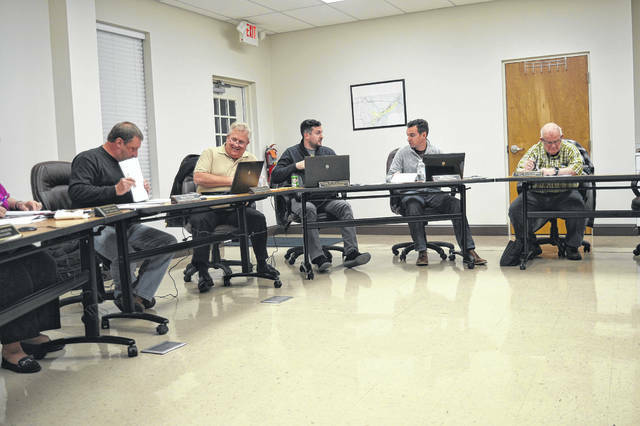 GALLIPOLIS — Gallipolis City Commission, Tuesday evening, discussed an upcoming arrangement to be potentially made with the Gallia Sheriff’s Office in regard to the housing of prisoners and financial duties in overseeing their care and transport and whether the municipality should press for changes in that arrangement. Ultimately, commissioners approved a first reading of a motion to allow City Manager Gene Greene to speak for Gallipolis in its discussions with the sheriff’s office, but decided nothing else. Contracting for corrections services is common among municipalities and sheriff’s offices throughout Ohio. Gallipolis officials have for the last few years been concerned with budget woes, the chief among those being the municipality’s police department’s funding, whose needs continue to grow based on the raising of expenses with equipment and training as well as the rise in crime due to the opioid epidemic. It is not uncommon for law enforcement needs to eat over a third of the town’s general fund. Gallipolis decided to start charging a majority of its crimes under state statutes in 2017. While area law enforcement and attorneys agree that Gallipolis ordinances and state laws often overlap, how a crime is charged affects what area of local government is responsible for funding the costs of inmates, according to Ohio Attorney General opinions. With the shift of financial obligation placed to the county and sheriff’s office budgets, this means they are responsible for transporting an inmate from detention centers to court, as well as funding medical expenses, housing and feeding. The Gallia Jail costs roughly $70 a day to house an inmate. The jail holds 22 beds. However, inmate populations often overflow due to the drug epidemic. Because of this, inmates are frequently housed in alternate locations as part of contracts with other law enforcement agencies throughout Ohio. Gallipolis officials claim that they are charged less for housing inmates in other counties. County commissioners held a previous meeting with area municipalities and law enforcement in October due to rising concerns with corrections funding. One county commissioner estimated that a little over half of the county’s general fund would be spent on criminal justice issues for 2018. The county states its general fund is around $8.6 million. While both the county and city call their legislating officers commissioners, both are separately responsible for their respective areas of government. Salisbury said during the Tuesday meeting that in previous meetings with other municipal legal counsel that it was a common trend across Ohio for municipal governments to charge under state statues as opposed to municipal legislation in an attempt to avoid higher corrections costs in municipal general funds. Gallipolis is technically a village as its last US Census population record did not tally above 5,000. However, it operates under its same city charter and has colloquially been called “the city” across Gallia County for years. Gallipolis officials took issue with a reported paragraph in paperwork with the county defining what a city inmate was and how his or her care would be funded when housed within the Gallia Jail. Gallipolis officials felt they should more closely adhere to definitions previously described with Ohio Attorney General opinions.